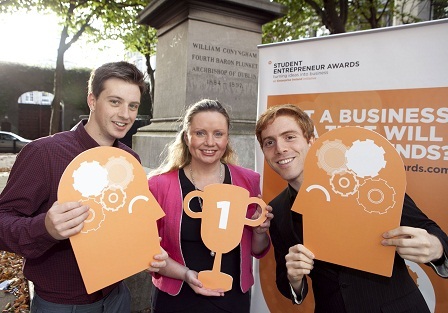 Student Entrepreneurial Awards – Internal Bootcamp competition. Enterprise Ireland Student Entrepreneur Awards 2015 Launch. Picture by Shane O’Neill / Copyright Fennell Photography 2014. In the run up to the Enterprise Ireland deadline for Student Entrepreneurial Awards of Friday 8thMarch 2019, WIT will be running an internal bootcamp competitionwith cash prizes on 13th& 14thFebruary from 4- 7pm each day. The Arclabs Student Entrepreneurship Bootcamp aims to assist in developing WIT full-time students’ innovative ideas into viable business opportunities by providing them with tools for future business growth. The Bootcamp will run in Arc Labsboardroom on 13th& 14thFebruary from 4- 7pm each day to help students get direction on the next steps by providing mentoring to develop their business ideas. Arclabs, the Research and Innovation centre at Waterford Institute of Technology (WIT) supports this exciting event for WIT students. · Mr. Keith McGrory – Former finalist at the EI Student Entrepreneur Awards 2016 & Inventor and Founder of HighTower Painting Products Ltd.
· How to protect my idea? Food and Refreshments will be provided throughout the evening.